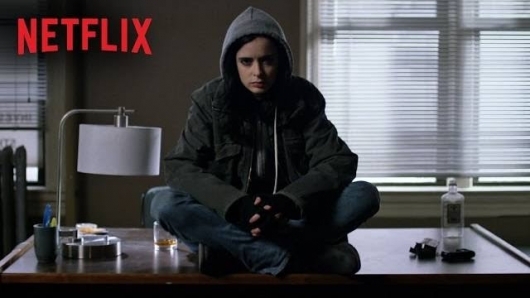 On the surface, Jessica Jones is the love child of Buffy Summers and Veronica Mars. She’s a hard-headed, superpowered private eye with a calling and a mission. But there’s more here. Ritter’s long played the outsider, the rebellious femme, the one who doesn’t go along to get along, and in Jessica Jones, she brings the lessons from her earlier that thespian oeuvre to bare, while adding just enough vulnerability for a mainstream audience to find her human (enough) to bear. It’s worth noting that this vulnerability doesn’t come from some feminine mystique or general girl next door vibe. It’s tied to Jones’ PTSD for an as yet uncovered trauma. She’s a superheroine and her vulnerability is literal, rather than figurative. It’s her weakness. As is important when it comes to comic book and other fiction that depicts the supernatural, there’s good foundation built around her abilities, so when she uses them, you’re more delighted than you are surprised. And that’s good. It something that Agents of S.H.I.E.L.D. could certainly learn from with it’s consistent Deus Ex Machina twists. Then again Agents of S.H.I.E.L.D. is for kids and Jessica Jones is certainly not. It’s smarter than the work Marvel’s distributing on ABC and though there’s less in-your-face violence than something like Agents of S.H.I.E.L.D., and it’s certainly more horrifying. Viewers will find themselves wholly disturbed when Jessica walks into a posh hotel room as part of an investigation and is confronted by a truly frightening scenario. JESSICA: I don’t flirt. I just say what I want. LUKE: And what do you want? Give me a break. That sort of laziness is what gives comic books a bad name in the mainstream. Still, it’s far from exploitive. Jones is a small-business owner in the criminal justice system, and is the walking embodiment of noir, even if the character herself is too cool to participate in the genre because she is indie to the core. That independence is attractive, because so much of this show breaks away from the Marvel of the big screen. Like Daredevil before it, it provides deep focus on the needs of just a few characters lives. That focus drives intimacy, and that intimacy makes me want to crawl under a blanket and watch the rest of the season in one sitting. Geeks and mainstream viewers are gonna be compelled to do the same. And that’s exactly what Netflix and Marvel want.